us the energy to heal ourselves. the function of each, we are able to balance our energies, augment areas in our lives, and even facilitate healing. maintain physicality. 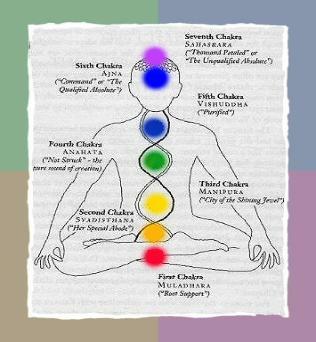 Each of the chakras in our body is keyed to a specific frequency, or wavelength, of energy. spectrum of visible (physical) light. appropriate color one can balance and strengthen the chakra. energies combine to form the aura. to succeed in business or material possessions. It is the center of manifestations. This is the center about family, security and grounding your self. The Sacral Chakra is about friendliness, creativity, sexuality, emotions and intuition. It's influenced by how emotions were expressed or repressed during childhood. you have found your unique gift, such as the work that gives you pleasure. This is the center for making choices. transcend the limits of your people, plants, animals, all of life. This is the center of relationships. you to people and people are drawn to you. The Brow Chakra is the center of psychic powers and higher intuition. Here you receive guidance, channeling, and tune into your higher self. The crown Chakra is located above the head and serves as the spiritual connection. It is the place where life-force enters. This is the center for coordination.